This year, Rebecca “Bucky” Willis ’12 is seeing the world and the way design makes it better. 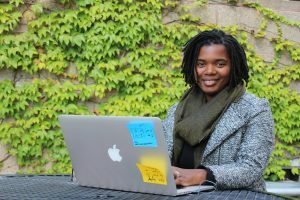 The recipient of five international fellowships, Willis has been to Toronto, Athens and Salzburg, Austria this year; closer to home, fellowships have taken her to Vermont and Chicago and, next year, to Washington state. 880 Cities Emerging City Champion Fellowship: Sponsored by the John S. and James L. Knight Foundation, this fellowship provides professional support and $5,000 to young innovators to create a project designed to “enhance civic engagement, improve mobility and activate public life in public spaces,” according to 880’s requirements. It’s a neighborhood she knows well, having grown up there and been inspired by the community work done by her parents. The project will be built in collaboration with the DCDC and Bleeding Heart Design, a nonprofit organization and design movement designed to inspire altruism. Willis founded Bleeding Heart Design, which was formed from her master’s thesis research. Creative Community Leader Fellowship: National Arts Strategies is an organization that supports initiatives that come at the intersection of community, arts and culture. This fellowship focuses on building skills and relationships with others who have projects addressing similar issues. What began as a network of financial stabilization programs for cultural organizations is now an organization that provides leadership education for those in the arts and culture fields. Fellowships go to artists, designers, cultural entrepreneurs, grantmakers and executives. Participants discussed ideas “all together in one house for a week in the middle of Vermont,” Willis said. In January, after months of video meetings with fellows, the group will reunite in Washington state to pitch ideas to venture capitalists for potential funding. Salzburg Global Forum for Young Cultural Innovators: This 10-year project brings together young intellectuals from around the world to discuss social improvement and sustainable development. Only 50 applicants are chosen from more than 500 applications. Sharing ideas and listening to development movements from around the world help participants develop skills, vision and networks needed to advance their organizations, causes and communities. “There are so many great ideas around the world and, in the long run, participating in these fellowships will only strengthen my work,” Willis said. Over its 23-year history, DCDC staff have earned 14 national and international fellowships, Pitera said. He says it’s important that DCDC employees participate in such programs for two significant reasons.